I picked this up at my local DavidsTea because it was marked down – I’m a sucker for new-to-me teas that are on sale. Quince Charming is said to be both hot and iced, as per the company that sells this black tea blend, so I’ll give both temperature extremes a try. When I opened the bag, the first thing I smell is the sweet smells of apples and pears. There’s some mild floral notes, and a brightness to the fruity aromas that reminds me a lot of lychees. Quince Charming is made up of apple, black tea, sweet blackberry leaves, hibiscus, apple pomace, quince, and natural quince flavouring. You can see quite a bit of the ingredients in the dry leaf. Quince often smells, to me at least, like pears, so I think that’s where the pear aroma was coming from. DavidsTea recommends steeping Quince Charming in near-boiling water for 4 to 7 minutes, near-boiling is 194-203°F (90-95°C). I steeped my pot of Quince Charming was close to 5 minutes for the initial steep. Quince Charming smells quite strongly of apples in the steeped tea. It’s a bright orange-red colour that is lovely to look at. When I smell the tea, the floral aroma is still very much present, and the apple fragrance is strong. I don’t really smell the pear/quince flavours that I noted in the dry leaf. On first sip of this black tea blend, I note that it’s quite tart. I think that’s to do with the hibiscus. There’s a certain amount of mouthpucker that I feel that this fruity-floral black tea blend lends itself to because of the ingredients. There’s a certain mix of tart and sour that reminds me a lot of sour candy. The floral notes in this tea are a bit overwhelming when the tea is hot, it almost seems a but perfume-y to me – just too much floral. I did pour a second cup over some ice cubes and found that the lower temperature helped to tone down the floral flavour. The tartness/sourness was a bit more palatable when the tea is cooler. I definitely liked Quince Charming better iced than hot. Quince Charming did a remarkably poor job with being resteeped. 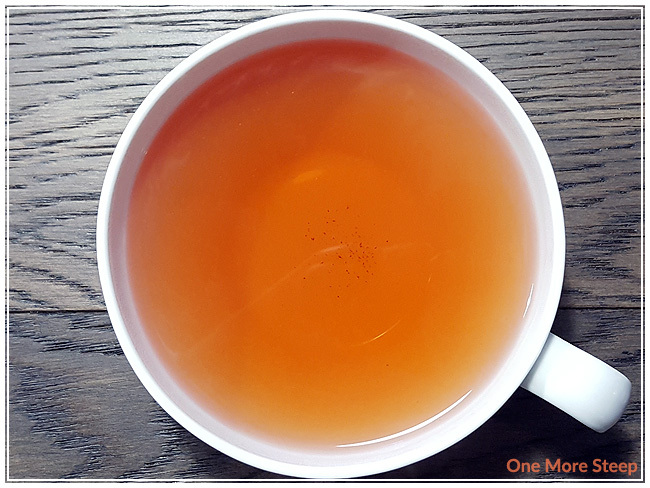 The flavours were watered down and tasted nothing like the initial steep that I did of this fruity black tea blend. I would say that Quince Charming is not good for one more steep. 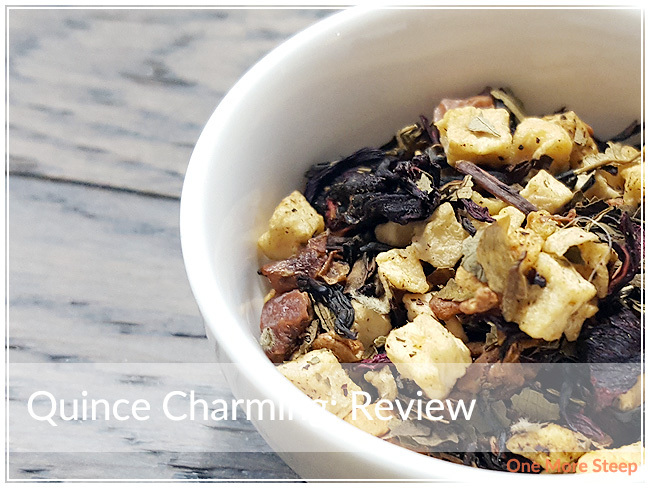 I thought that DavidsTea’s Quince Charming was just okay. 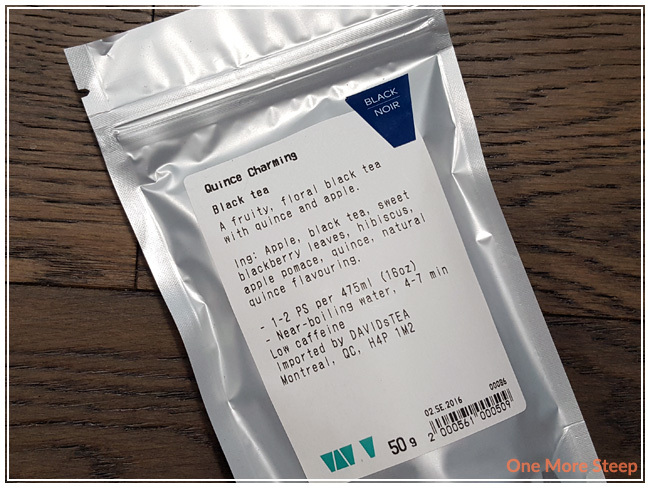 I did not like this tea hot at all – the floral notes were overwhelming and it was far too tart and sour for me, I can’t imagine how it would have tasted if I had left it to steep for a full 7 minutes! That said, Quince Charming does quite well as an iced tea. A bit of sweetener would help to balance out the tartness, but having it iced helps as well. Unfortunately, this tea does badly at being resteeped, so there’s no added value there. 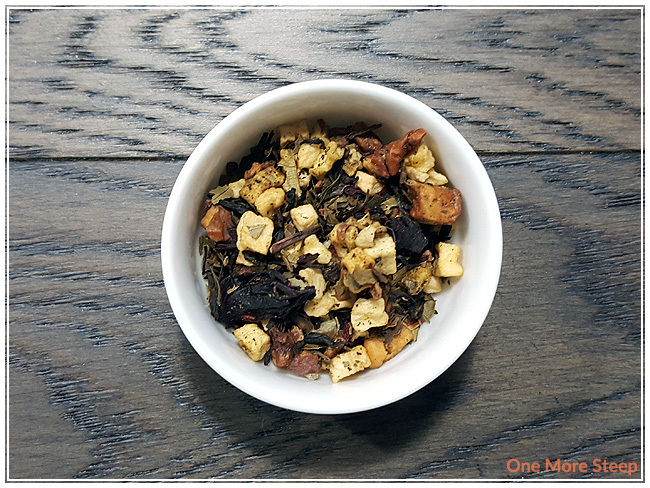 I find that it reminded me quite a bit of Honeycrisp Apple (an apple green tea blend from DavidsTea), but with some minor changes in ingredients. 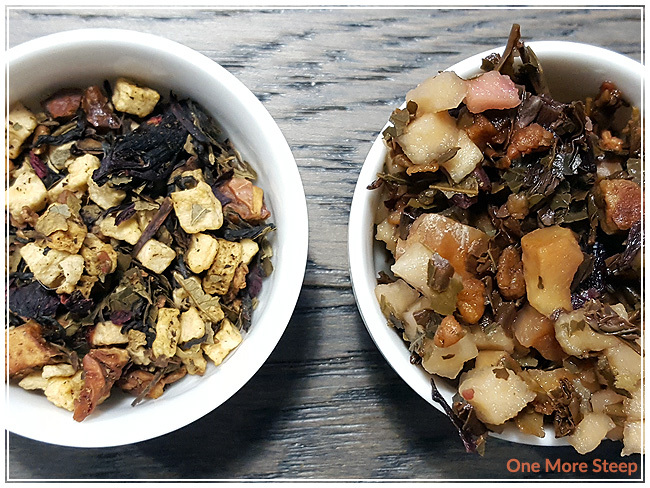 Between the two apple tea blends, I would opt for Honeycrisp Apple over Quince Charming.